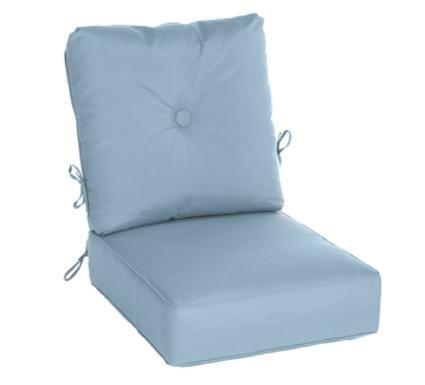 Item #7550 - Estate Series Deep Seating Cushion. Boxed with self welt and zipper with self covered button on the back and ties at the seat and back. Dimensions: (seat) 24" wide x 27" deep x 7" high; (back) 25" wide x 26" deep x 6" high. Stripes add 10% to the cost of the cushion. Order 7550ST for stripes. Fits: Bordeaux, Hyde Park, Lancaster, Mayfair, Newport, Sherwood, South Hampton, St. Augustine, St. Moritz, Stratford, or Wilmington. Foam core with polyester wrap fill.